Pablo Larraín’s biopic about Chilean Nobel-winning poet, diplomat and politician Pablo Neruda (1904-1973) (Gnecco),revolves around his at-large cat-and-mouse game with a relentless but allegedly made-up police officer Oscar Peluchonneau (Bernal) closely tailing him during thepersecution of Communists issued by the Janus-facedPresident Gabriel González Videla (Castro) in 1948. Right out of the box, Larraín archly lays bare his derogative slant toward Videla’s government by showing a then-Senator Neruda wrangle with others in the Parliament’s resplendent bathroom, before lends him a rodomontading stage of poem recitation during a private gathering, and later doesn’t hold back in sending him into a brothel for debauchery, further on, venting barbs to his loyal helpmate Delia del Carril (an age-defying Morán), whom he must leave behind in the third act when heading to the Andes mountains where he will secretly escape to Argentina on horseback. On balance, Larraín’s view of Neruda is a solid composite of varying complexities, a larger-than-life character exuding a ghost of mystique, also on the strength of Luis Gnecco’s fine performance. 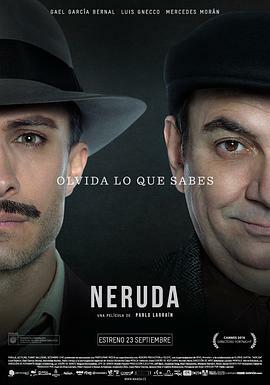 But essentially the film is a meta-fictional dyad of Neruda and Oscar,it is the latter's self-inspecting voice-over traverses the entire running time and whose inexorable pursuance is futile in foresight but, by virtue of Larraín’scurve-ball construct of obfuscating the boundary between fiction and non-fiction, Oscar’s quest of finding his identity (by the time of the third act, the predator-and-prey pursuit is saliently evolved into a poetic voyage),in fact strikes a more affecting chord with audience by being sublimated into a sort of existential mulling over an individual’s congenital frailty: blindly overreaching oneself to compensate for (mostly self-induced) one’s deficiency in self-esteem.Gael García Bernal effectively engineers Oscar’s painful self-sacrifice with an almost pilgrim-like piety and gravitas. On the one hand,Larraín’s innovative deconstruction-inflected modus operandi brings a wheeze of freshness in the time-worn biopic genre (so is his JACKIE 2016), but on the other hand, it is still an inchoate approach that overly relies on a director’s artistic propensity, in this instance, the whole package of NERUDA’s saturated, purple-bluish hue, starkly freewheeling camera movement, and a disconcerted accompanying score could not be every cinephile’s cuppa, notwithstanding how stimulating it might sound on paper. referential films:Larraín’s JACKIE (2016, 7.7/10); Sebastián Lelio’s GLORIA (2013, 7.8/10); Alejandro Jodorowsky’s ENDLESS POETRY (2016, 7.2/10).